The Bell 407 and Bell 429 are some of the most ubiquitous aircraft in the modern sky. These two models have been used by police, news, emergency rescue crews, hospitals, private individuals, and militaries the world over since 1996. They are fast, agile, comfortable and flexible. We were granted exclusive access to the airport used to train 407 and 429 pilots in the hometown of Bell’s corporate headquarters – Ft Worth, Texas. This airport is a purely industrial airport, meaning that no commercial passenger jets fly in or out of it. This reduction in air traffic provided excellent recording conditions. During our time on the tarmac we captured pristine movements like starts, hovers, aways, returns, spin ups and spin downs. We recorded interior and exterior on the tarmac, and captured many beautiful long tails in and out. There was no rush, and we took our time getting what we needed. Once we had the tarmac coverage we needed, we headed over to the training area a few miles away. In this spot pilots in training practice flight maneuvers like hovers, turns, and the very tricky autorotation landing. To do an autorotation, the main engine is shut off while the helicopter is in flight, and the freewheeling rotors keep turning purely on wind friction. Once safely on the ground, the helicopters would spin back up and take off again. It is an amazing thing to see and to record. Each exterior recording was made with a small array of mics that were time and phase-aligned in post to produce the fullest and cleanest representation of the sounds possible. The whole is greater than the sum of its parts. 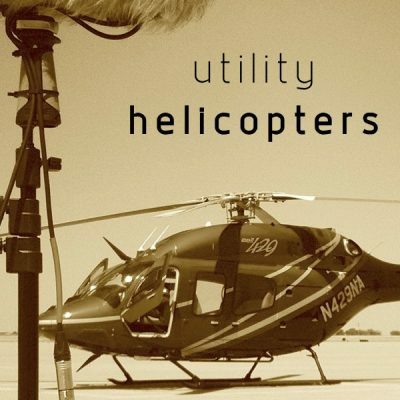 Listen to the demo, read the file list, and own a beautiful set of modern utility helicopter recordings.